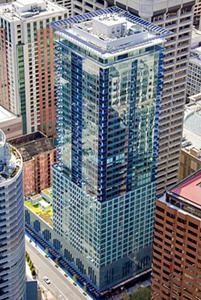 Sales at Seattle’s luxury Olive 8 Condo tower have picked up in recent months with 25 sales since the start of the year. This month alone there’s been 7 closings and another 3 sales. The current promotion, which ends on May 31st, likely provided the extra incentive that boosted sales — mortgage interest rates from 1.5%, no closing costs and no HOA or club fees for a year. Overall, the development is now 60% sold. It also helps that competition from other new construction condos in the downtown Seattle area has compressed. The only other property with a good number of units available is Escala (compared to Enso which is 90% sold and 1521 Second which is 80% sold). According to a recent article by Realogics Sothebys, who incidentally is marketing Olive 8, Seattle’s new construction condo inventory shrunk 40% through absorption (sales) since the 2nd quarter of 2010. And, with no new condo buildings breaking ground since 2007, we really won’t see an increase in new inventory for several years…though at least one Belltown project has been seemingly optimistic that it’ll start this fall. Disclaimer: Olive 8 is an advertiser of SCL at the time of publication.